69. What if Mark Martin didn’t pull-in early at Bristol? He looks surprised--and for good reason! Background: Long before Kyle Busch, Carl Edwards, and almost everyone who races for Team Penske, Mark Martin was the original “Buschwhacker”, dipping down into the Busch (now Xfinity) Series for extra seat time and an extra payday. Always a threat to win in his 60 Winn-Dixie Ford, he looked to be on his way to another victory in the 1994 Goody’s 250 at Bristol. What Actually Happened: Martin seemed to have overcome a day of radio issues to win the race under caution (at this time, there was no “overtime”/green-white-checker rule). However, instead of taking the checkered flag, a confused Martin, thinking the race way over, pulled off the track in turn four, essentially putting his own car a lap down. David Green moved up from the runner-up position to win the race. What Could Have Been the Turning Point: What if Tommy Houston and Tracy Leslie hadn’t pulled-up to Mark under caution to congratulate him, making him think that the race was over? 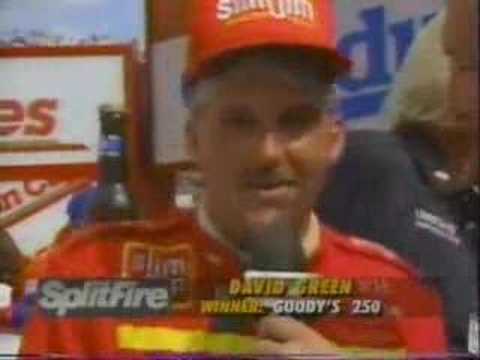 What COULD Have Happened: Even without the win, Green still would have had enough points to win the 1994 Busch Series Championship. This is significant because that day was his ONLY win of the season—Green would have won the championship without a single race win! And if THAT Happened…: Having a driver win a national touring series championship without a race win may have been enough to spur Nascar to overhaul its points system, which in those days rewarded consistency more than anything else. What Else Could Have Happened: For better or worse, we would have missed Mark Martin’s humorous, conciliatory post-race interview after his goof-up. While it was obviously a bonehead move, it took a big man to face the media (and his fellow competitors) afterwards. 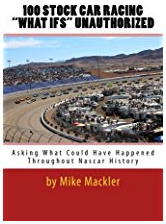 Why It Had to Turn Out The Way It Did: Under the rules at the time, you had to finish the race under caution at speed, and Mark Martin simply didn’t do that. 1.) How good does the paint scheme look? 2.) How memorable was it? Furthermore, variations were taken out of the equation—only one paint scheme per driver was included on this list. 5. Bobby Hamilton STP Silver Anniversary. Some paint schemes can seem like prisoners to the past—Dale Earnhardt Sr.’s black GM Goodwrench look, for instance, stayed virtually identical through the years. Others, like Richard Petty’s STP red-and-Petty-blue scheme, changed year-to-year to the point where its difficult to call any one of them “iconic”. But one notable exception was when the 43 team ran a silver anniversary paint scheme to honor STP’s 25th year sponsoring Petty Enterprises. The perfect example of how a refresh can make the old look new while still remaining familiar, the only downside was that this look only ran for about 2/3rds of the races in 1996 before never being seen again. Why this scheme over…: any other STP scheme? As I said above, no one year’s scheme really stands out above the rest. I guess you could say the last look Richard Petty had (during his “Fan Appreciation Tour”, but that came a year before the purview of this list. 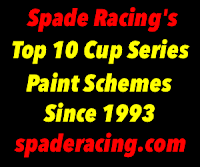 However, if this was a list of the WORST paint schemes of the past 25 years, we could fill up most of the list with Petty Enterprises Cheerios cars. But what about…: any other silver car? Well, unfortunately the best of them (Dale Sr.’s Winston anniversary car and Terry Labonte’s Ironman schemes) were only run for a race or two each. 4. Kyle Busch 2018 Yellow M&M’s. Let’s be honest here—almost any M&M’s paint scheme, going way back to the Ernie Irvan days, looks great. The colors pop, the characters are a nice touch, and its extremely easy to see who the sponsor is from far away. Picking just one is a difficult task, but for me, 2018 is the best so far. The use of the classic yellow base color a nice touch, while the rainbow lineup of M&M’s on the back of the roof is a great innovation. or RYR M&M’s scheme? Really, it all comes down to number style—the biggest variant amongst the numerous yellow looks over the years for this sponsor. The “painted on” look of the 36 and Elliott Sadler-era 38 always seemed cheesy to me. And while the David Gilliland-era block 38 was a marked improvement, the single “M” candy on the hood was a detriment. 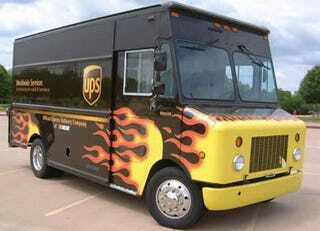 But what about…: the UPS car? Just kidding—the UPS brown-and-white is just about as far from the colorful M&M’s as you can get. Besides, Dale should’ve run the truck. People love the truck. 3. 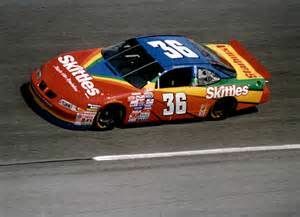 Derrike Cope/Ernie Irvan 36 Skittles: In the pantheon of candy, fruity Skittles always comes up short against its corporate cousin, chocolatey M&M’s—except here. 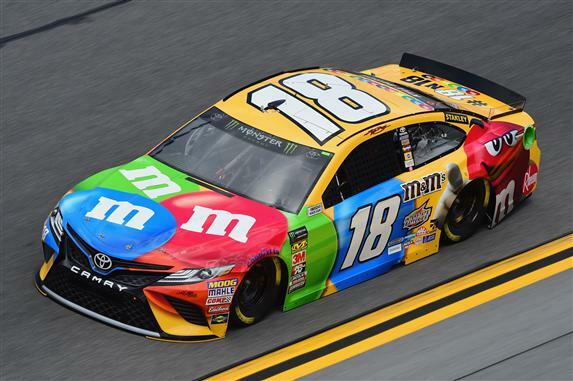 Taking the idea of a rainbow car and turning it on its ear, we got the perfect interplay of bright and deep colors, never obscuring the sponsor’s name or the number on the car. Also notice the little touches like black lines between each color and the forward-sloping number. Near perfection in paint—too bad that on the track the car, well, sucked. 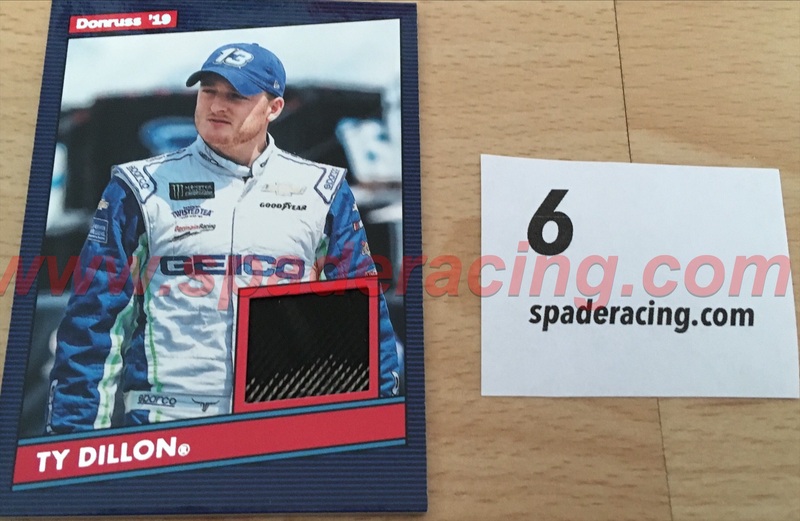 Why this scheme over…: another rainbow “knockoff”? Look, I’m aware that the Skittles car was likely an attempt to sponge off the notoriety of Jeff Gordon’s “Rainbow Warriors” look, but this car just looks so much better than any other imitator. Want to see a copy that looks worse than the original? Check out Kyle Petty’s 1996 Coors Light car. But what about…: Terry Labonte’s Kellogg’s Corn Flakes cars? 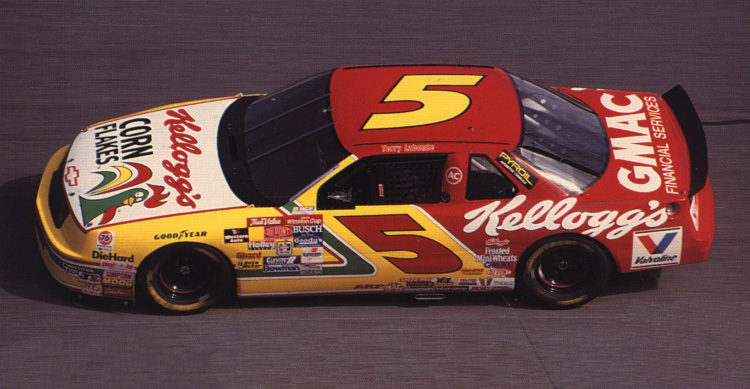 Texas Terry had some great, colorful looks in the 5 car, particularly with Kellogg’s as the sponsor. Unfortunately they tended to look either slightly too staid (the regular scheme) or way too crazy (almost any special paint scheme). 2. Kyle Petty Mello Yello. 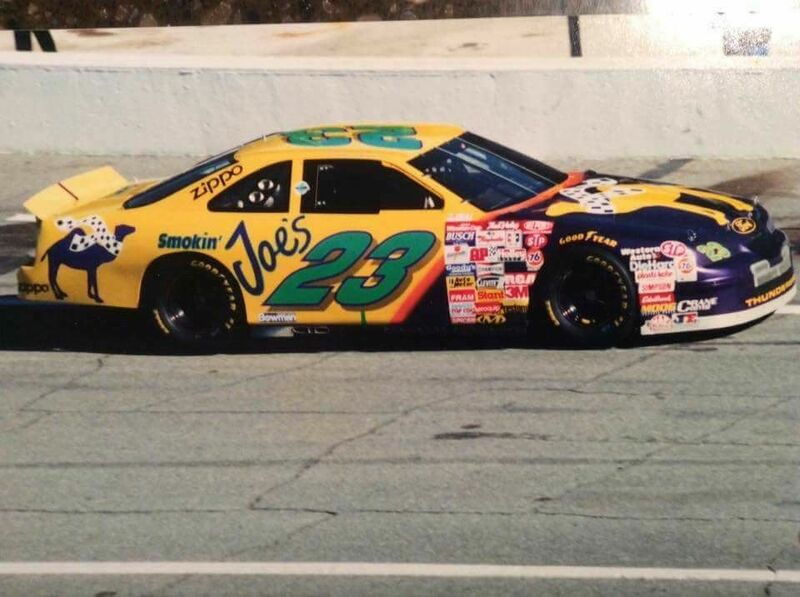 Its tough to find a more-iconic paint scheme than the Mello Yello look of the 1990’s. Whether it was the real-life Kyle Petty scheme or its Hollywood inspiration from Days of Thunder, the day-glo colors seemed to jump off the glossy black paint. Combining neon green, bright yellow, and a nearly-orange red, it was about as close to perfection as you could get. Why this scheme over…: Bill Elliott’s McDonalds scheme? Another combination of bright (yellow) and deep (red) were most of Bill Elliott’s McDonalds looks. However, there were two things working against it—no one scheme really stood out amongst the others (a little white—no, no, lots of white—no, wait, NOOO white at all! ), and the red car paired with yellow and white seemed to blend in with far too many other cars. 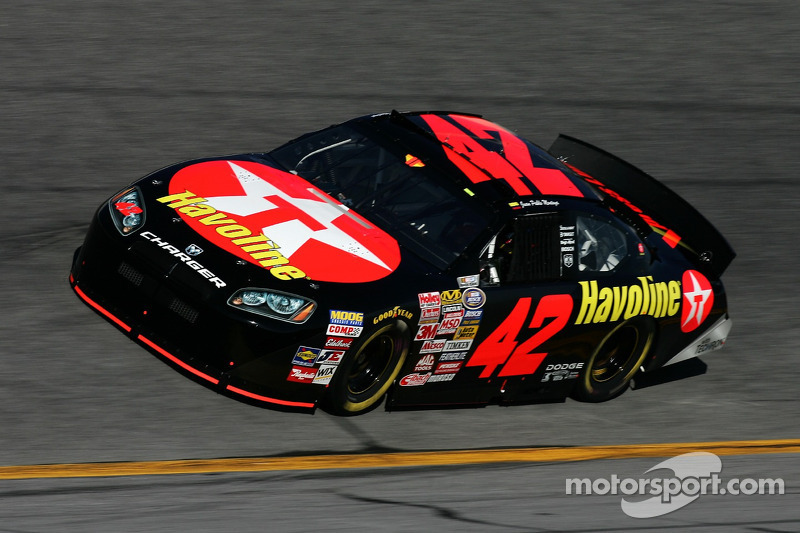 But what about…: Ricky Rudd’s non-Texaco Havoline scheme? 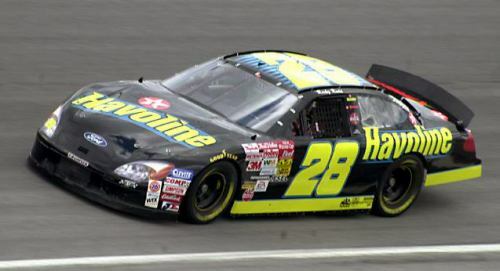 This nearly-forgotten paint scheme combined many of the same attributes as Kyle’s car did, but unfortunately seemed to leave little impression upon most fans. 1. 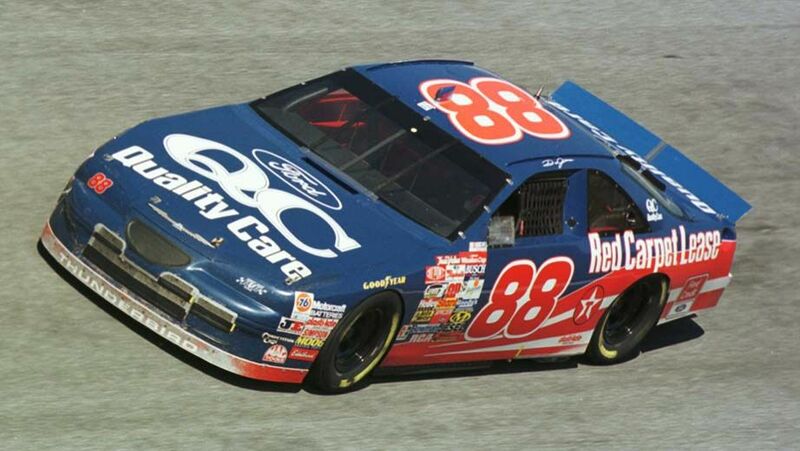 Dale Jarrett’s first Ford Quality Care car. In my opinion, this is the gold standard amongst modern paint schemes. A perfect color scheme (hard to argue against the stars and stripes). A beautiful design that rides the razor’s edge between understated and busy. The clever way of working in the Texaco associate sponsor logo. Even the bubbly number style works well here. There’s lots of great paint schemes through the years, but this one is great on all fronts. Why this scheme over…: later Ford Quality Car schemes? Two small changes happened the next year that were slight—but noticeable—downgrades—the loss of the “Red Carpet Lease” lettering on the quarter panels, as well as the cluttering of the “stripes” part of the design with more associate sponsor decals. But what about…: the special paint schemes from the first race after 9/11? 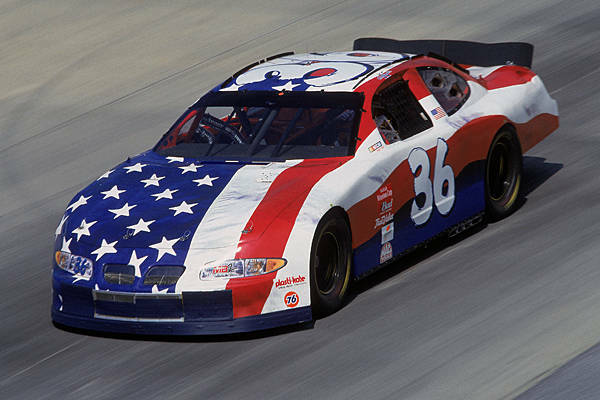 Well, those were beautifully patriotic—but they were special paint schemes, only for a single race. Maybe they’re for a different list for a different time. 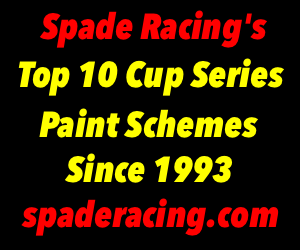 And now, without further ado, here they are—the Top 10 Cup Series Paint Schemes Since 1993 (PART 1)! 10. 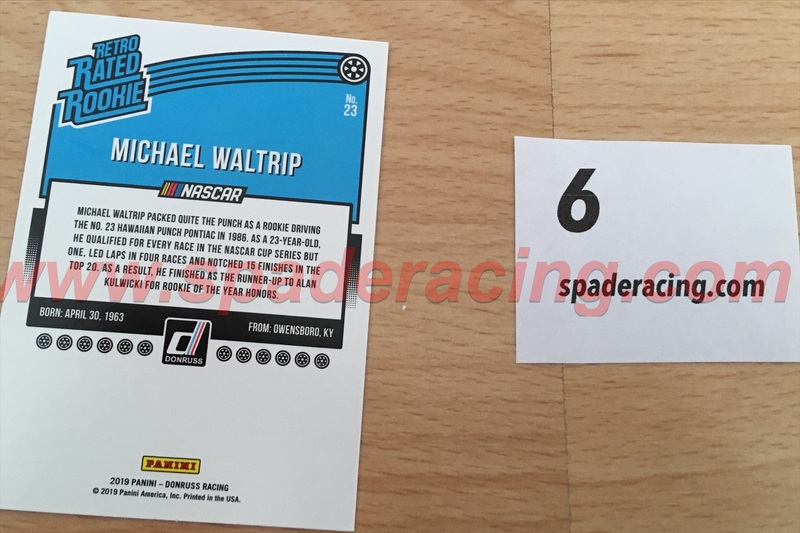 Rusty Wallace Miller Genuine Draft. Sometimes less is more, as evidenced by this classic understated look Penske Racing South campaigned throughout the early-90’s. The combination of bright gold, black, and white works fantastic together, whether the car is dueling for the win at Bristol or flying through the air at a plate race. Why this scheme over…: the one year “Miller Beer” car? It was a decent attempt at a refresh, but looked far too busy compared to the original. Meanwhile, I always thought the white Miller Lite look Rusty ran for the last few years of his career looked drab. But what about…: Dale Earnhardt’s GM Goodwrench car? Same philosophy as Rusty’s, but the white-on-black look always seemed, well, a bit boring to me. With that being said, the “PLUS” variation nearly beat out Rusty for this spot. 9. 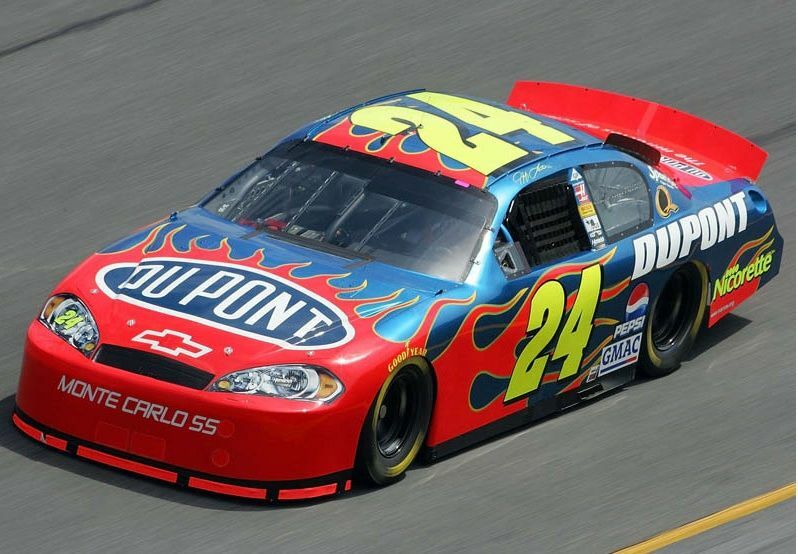 Jeff Gordon DuPont “Flames”. Jeff Gordon debuted in Cup with an iconic paint scheme, the DuPont “Rainbow”. But when it came time for a new look, Hendrick Motorsports upped their art game with the striking “Flames” car. Perhaps the best example of how to use a bunch of bright colors at once, variations on the template were used almost exclusively with other part-time sponsors (AARP, Nicorette, etc.) for the rest of his career. Why this scheme over…: the “Rainbow Warriors” look? Well, maybe I’m in the minority here, but I always thought the rainbow scheme was missing that certain “something”. Maybe it was the odd lack of the color red, or maybe it was too much neon, but I’ve always liked the “Flames” car better. But what about…: any other neon car? 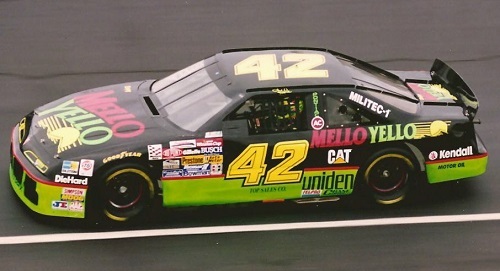 Plenty of other cars used a mixture of bright neon colors, but the 24 team gets points for originality and the right amount of restraint (lest we forget the 23 car’s Smokin’ Joe’s monstrosity). 8. Mark Martin Valvoline “Flying V’s”. Mark Martin was one of the top drivers in Nascar throughout the 90’s, but his Valvoline paint schemes left much to be desired…at first. In 1998 his car got a radical new refresh—keeping the red, white, and blue color scheme but replacing staid stripes with bold splashes of color. Upon closer inspection, the edges of the “splashes” were actually tiny little V’s, an awesome nod to Valvoline’s longtime logo. This truly was a refresh done right. 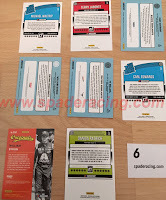 Why this scheme over…: as stated above Mark’s other Valvoline schemes were pretty tame, and the odd-looking font for the car number didn’t help matters. The closest he got to something this adventurous would come late in his career with the garish Go Daddy 5 car. But what about…: the Jasper 77 car ran a similar scheme with blue, red, and yellow, but pretty much anything run by this team was the definition of “unmemorable”. Heck, their hideous yellow car stands out more in most people’s memories. 7. The best looking "Tide Ride"
7. Ricky Craven Tide Ride. Tide had been involved in Nascar since the 80’s, but something always seemed to be missing. Strangely enough, that “something” turned out to be a simple touch—blue numbers. The “32” on the orange-and-white PPI car really popped and somehow seemed to make the day-glo orange paint seem even brighter. 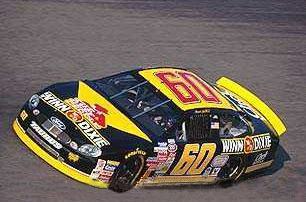 A number of drivers ran this scheme, but Ricky Craven gets the nod for memorability alone. Why this scheme over…: any other Tide look? The Ricky Rudd-era cars always seemed a bit sedate thanks to white numbers and a somewhat jumbled look, and Darrell Waltrip’s inaugural scheme came before the time frame of this list. But what about…: any Interstate Batteries look? Granted, Joe Gibbs Racing’s various Interstate Batteries paint schemes (especially in their early years) showed how to mix darks and neons. However, the lack of a consistent look over more than one season, combined with the sometimes arbitrary-seeming layouts, keep them off this list. 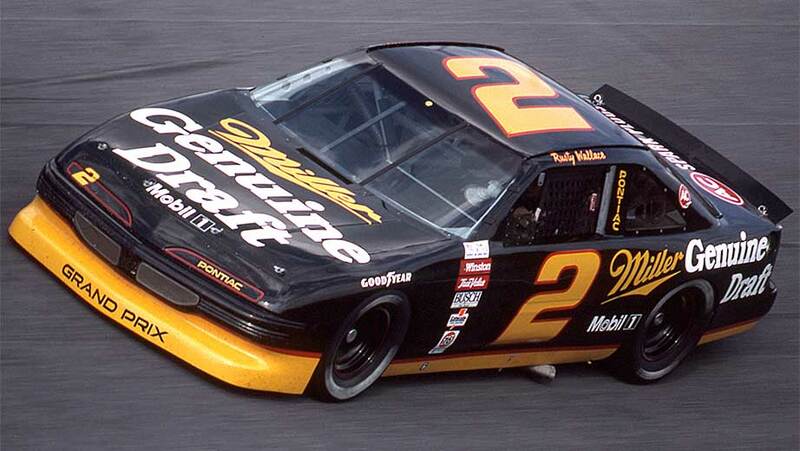 Why this scheme over…: a Davey Allison scheme? Davey’s last Havoline look barely qualified for this list, coming in 1993, but again, lost out due to an inferior number style and a slightly-dull look. Admittedly, the first “Battlestar” scheme or the seldom-remembered black-and-gold looks could’ve made this list had they not come too early. 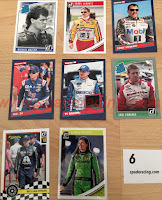 But what about…: a Ganassi Target paint scheme? Ironically the most-iconic of Chip Ganassi Racing’s paint schemes were the various Target-sponsored cars they campaigned—however, none of them really stand out from the others, and it could be argued that red-and-white is the most-overused color pairing in the sport. Alright, on a roll here! Sure, I didn’t win the March Madness Pool this year (like there’s any skill involved in that anyways, eh?). And sure, I’m working seven days in a row starting tomorrow. But here, in the Nascar world? I got 3 wins in Cup Favorites, Mystery is still winless, and I’m smoking the field in Xfinity and Trucks! Speaking of smoking, here’s a new one—my employer was forced to issue new rules for employees on vaping. Now, I used to smoke back in my 20’s—had to quit when my now ex-wife put the kibosh on smoking in the car—but vaping? I’ve never understood it. I mean, who wants to blow a bunch of bubble gum-scented vapor into a customer’s face? I don’t often say this, but good on corporate for cracking down. CUP SERIES Toyota Owners 400: Mystery Picker picks Clint Bowyer. Favorite (3 wins): Kyle Busch—its not like Rowdy’s unfamiliar with winning on Saturdays. Next Favorite: Martin Truex Jr.—Jersey’s finest gets himself into the win column. Dark Horse: Ryan Newman—breaking through and making Trevor Bayne look bad. XFINITY SERIES (5 wins) ToyotaCare 250: Christopher Bell—Keep their heads ringin’ for another week. 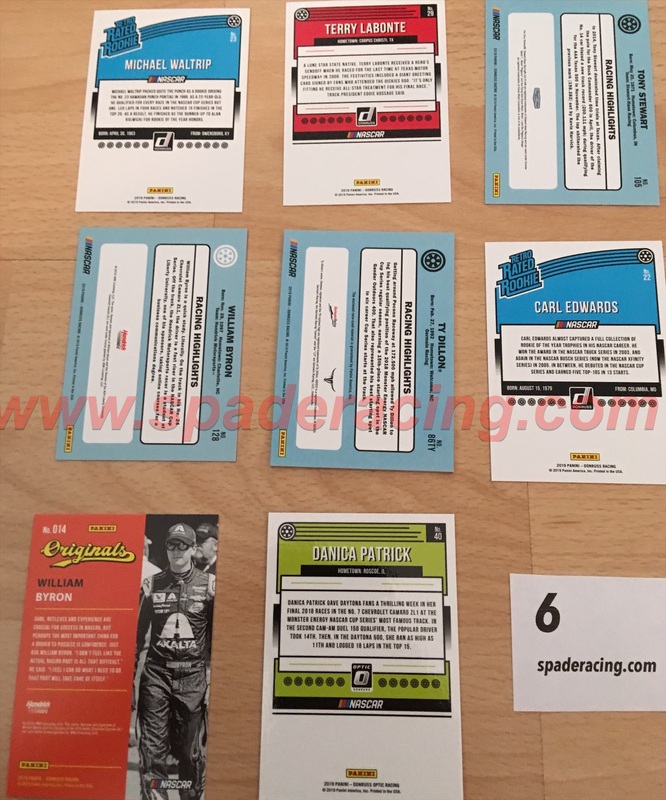 OVERVIEW: The cards here could pretty much be divided into two categories—90’s/00’s stars and rising stars of today. Well, again, there’s the Danica outlier here but at least its in OPTIC. 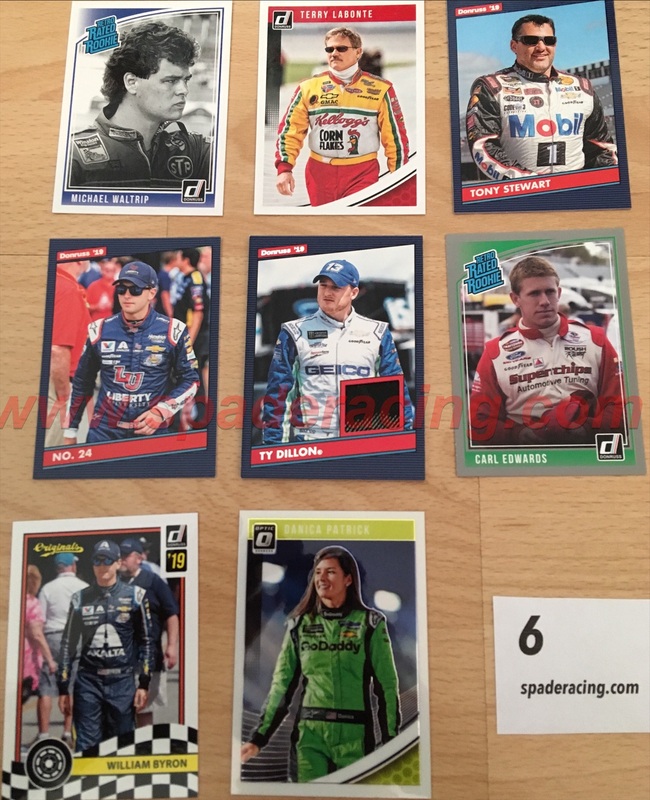 SPECIAL SPECIAL: William Byron gets the “Originals” treatment. While I’m guessing its a way for fans to learn a bit more about a driver’s personality via a longer than usual quote, Byron talking about how “I don’t feel like the actual racing part is all that difficult.” isn’t likely to garner him any admirers. 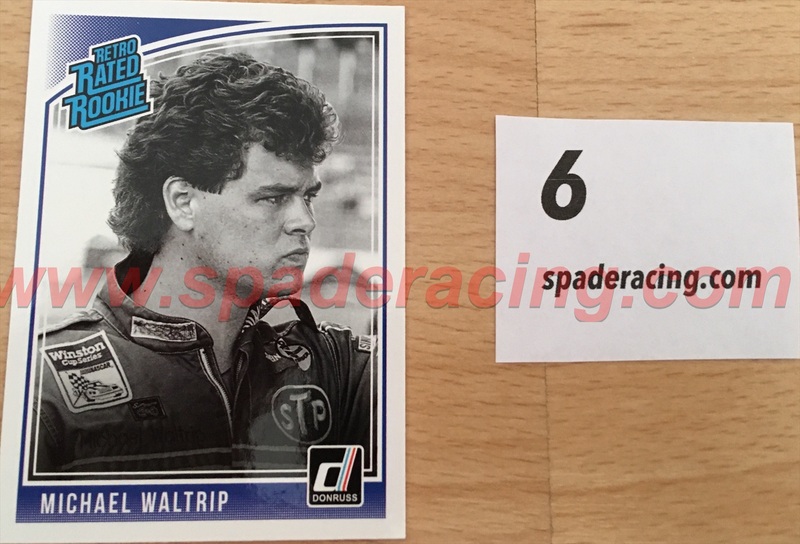 IN FOCUS: Let’s all take a good long moment to admire the flowing mullet of Michael Waltrip from his rookie year. SPOTLIGHT: And we have our first memorabilia piece! This is a part of Ty Dillion’s tire, looking like it may have been a little bit flat-spotted. Jimmy Spencer The Giant Memorial Battle Royale: 20 drivers on the back end of the Cup garage compete for a life-sized trophy and a chance to meet Jimmy Spencer himself, who will angrily remind them that he’s not dead. Christopher “C-Bell” Bell vs. Matt “Matty D” DiBenedetto vs. Erik “That” Jones “Boy” in a Two-Falls Elimination Match—winner of the first fall gets the 20 Cup car in 2020, winner of the second gets the 95 Cup car, loser gets five races in the JR Motorsports “All-Star” car. Brandon “BJ” Jones vs. Matt “Master of his” Craft-on—$10,000 Menards Challenge, winner gets a $10,000 shopping spree at Menards, loser gets a $100 gift certificate to Hechinger’s. Six-Man Tag Championship: The Front Row (Matt Tiffffft, Michael McDowell, and David Ragan) vs. The SH(u)R(e) Things (Aric Almiola, Clint Bowyer, and Daniel Suarez)—if McDowell and Suarez touch before the match bell, both will be suspended for six months. CUP SERIES Food City 500: Mystery Picker picks Austin Dillon. Favorite (2 wins): Kyle Busch—in which Rowdy takes out his anger on not being able to race on Saturday on the Cup field. Next Favorite: Denny Hamlin—two in a row. Dark Horse: William Byron—a little pit strategy and a lot of luck could work wonders. XFINITY SERIES (4 wins) Alsco 300: Christopher Bell—only one man can stop him…and he’s not allowed to run this race.